In the distance future, robots will take over. 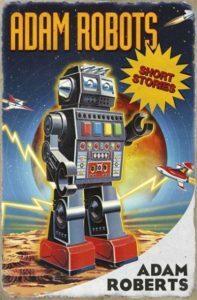 Well, the future is now…The ‘Adam Robots’ collection of short stories by UK author Adam Roberts contains tales all containing, well…robots. Known for a career that drift from Science Fiction to parody, Roberts doesn’t adhere to any one style of story in this collection, with each one significantly different to the previous. In some ways, this works well, creating an unique reading experience however it can jar at times and a little difficult for the reader to get into a rhythm. 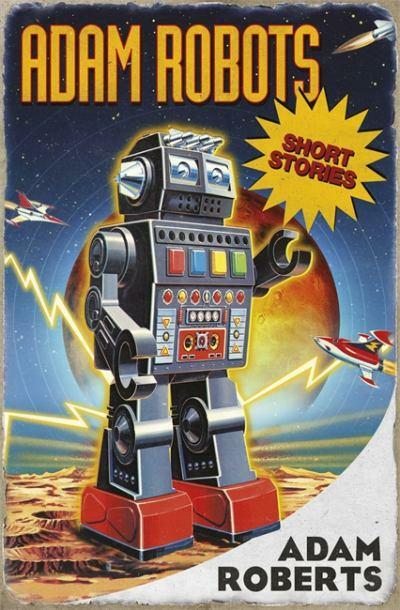 There are 24 stories here and, while the book is pitched as a collection of robot tales, especially with a beautiful old school cover image, some of them don’t deal with traditional style robots so there’s plenty of variety. In fact, I question if some of the stories would work in another anthology because the more traditional robot stories really warm you up for the more out there ones. There are some shades of Asimov in Roberts’ work, especially in the titular story, ‘Adam Robot’, where a robot’s free will is tested in a Garden of Eden scenario. It’s an interesting story that manages to cover religion, choice and death in just a short space. This is a great showcase of his talent. Anyone can tell a deep story in hundreds of pages, Roberts manages it in just a few pages. ‘The Imperial Army’ is a stand-out story in the collection in which a young man discovers that he is the template for an army and, at first, sets out to stop them then enlists to eventually lead them. It’s played out beautifully and logically to a satisfying conclusion. There’s also a lovely poem, ‘The Mary Anna’, in which Roberts flexes his writing muscles and covers a wide variety of styles in one piece. That’s not to say this is perfect, there are some misfires in the series, such as ‘Woodpunk’ proving a little insipid with the styles jarring. It’s a bit of mixed bag but the stories that work make it worthwhile if you can overlook the stories that don’t. In fairness, it’s a pretty high success rate so if you want to sample a great British writer, pick up this collection. « Humans: an appraisal of the first TV episode by: GF Willmetts (TV series review).